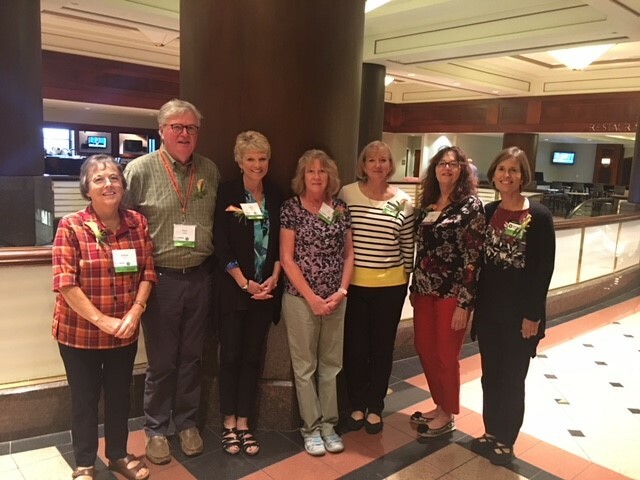 BLOOMINGTON, Ill. – University of Illinois Extension would like to congratulate the following McLean County Master Gardeners on receiving state awards at the Illinois Master Gardener Conference in Springfield this September. 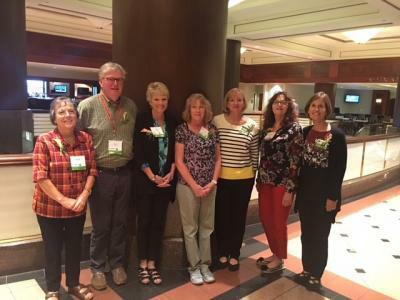 Barb Wells and Kathie Otto were recognized as 2018 Outstanding Master Gardeners in Illinois. The Outstanding Master Gardener State Award was established to honor the best of Illinois Master Gardeners. Only the top 2% of Illinois State Master Gardeners win this award annually. They must exceed in leadership, determination, positivity, initiative and be highly involved in the program. Barb has been instrumental in maintenance and programming at Sarah's Garden at David Davis Mansion, Unity Community Center Jr. Master Gardener program, and chairing Home, Lawn and Garden Day in 2017. Kathie has been a key leader at the Illinois State University Horticulture Center Herb Garden, Home, Lawn and Garden Day, Community Cancer Center Healing Gardens and the Therapeutic Horticulture Conference. Barb and Kathie are both always willing to help out where needed and do so with a positive attitude and smiling face. Mary Dellorto received the Sustained Excellence Award, which was established to honor Illinois Master Gardeners who have previously received the Outstanding Award and have continued to demonstrate distinction in the program. Mary, a Master Gardener since 2007, has been involved in multiple committees and projects, including serving as president and treasurer of the group. Mary's can-do attitude and great leadership skills are admired by all in the group. The Holton Homes Jr. Master Gardeners/Nature Workers 4-H SPIN Club received the Master Gardener Teamwork award, which was established to honor projects which have made a difference in the community or Extension unit. The group of Master Gardeners had to show a focused team approach to a project, innovation and improving an existing project to serve their community better. McLean County Master Gardeners part of this team were Carol Csanda, Tom Creswell, Elaine Yoder, and Jo Devore. This project allows youth in the neighborhood to join a 4-H Special Interest (SPIN) club members who participate in gardening to exhibit vegetables and flowers at the McLean County 4-H Show every year. In the process of preparing vegetables and flowers to exhibit at the 4-H Show, the young gardeners learn the necessary guidelines for producing and preparing fair exhibits. Being part of the 4-H program allows our club members additional educational opportunities and encourages leadership and citizenship development. Congratulations and again great job to all of the recipients. Remember if you see the McLean County Master Gardeners working or teaching in your community, make sure to thank them for their outstanding efforts in improving the community and helping others learn to grow. For more information about the McLean County Master Gardener program, visit us at go.illinois.edu/LMW_MG or contact the McLean County Extension Office at (309) 663- 8306.